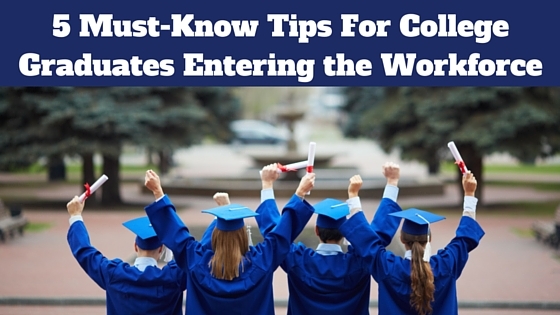 As you think about leaving your college years behind and look for the first step on your career ladder, it is important to get off on the right foot. Too many people make the same mistakes when approaching the job market. This article has been written to guide you through the quagmire, so here are five easy-to-follow tips that will get you ahead of the competition and off and running towards your career. Get a professional email address – Sorry to burst the bubble, but it is time to let go of the infamous email address you have. Your future employer will not be as impressed with your letsparty101@yahoo.com address like your college friends are. Get a new email address and use your first and last name wherever possible. Clean your online presence – Employers are using social media to find out what type of person you are. So, think from their point of view about the photos you have posted from last summer. If your potential employer saw them, would they be put off? Google yourself – If you have not done this, you will be amazed how much information is out there. Photos, postings, dating sites, Facebook, Twitter; they are all there for access. Again, just make sure there is nothing out there that could jeopardize your chances before you even get to the interview stage. Get a professional online presence by using LinkedIn – There are tons of great articles about how to build your profile with all the tips and tricks you can think of. The staff at LinkedIn.com are also extremely helpful and want you to do well. In the world of sales and marketing, the term USP (unique selling proposition) has been around for several years now but in terms of personal branding, the latest trends are emphasizing the need to have your very own USP. Think about what makes you different from the others. Simply stating “I work hard” or “I am a team player” will only get you so far. Hiring managers are looking for innovative thinkers and your personal branding can be a direct reflection of that and can make a great subject matter for your interview. The next point is to dress for success. Make sure your image reflects the position you are applying for and it is consistent with your social media presence. For example, being clean shaven on LinkedIn will quickly come undone if you are sporting a three-month beard on Facebook. You want to be taken seriously and thinking through your personal branding will really help you get there. This will not come as a surprise to you at all. You have heard about the power of networking and the potential it can bring, but few rarely see the full opportunity and even less actually execute it. For you to get into the world of business, you must network yourself until you are blue in the face, then do it some more. Out of all the tips provided here, if you do this one and do it well, you will see success from it. Networking comes in a variety of forms and range from talking to your family to meeting strangers. Start with the easiest form which will be telling your family, friends, teachers and classmates you have started your career search and share with them what you are hoping to achieve. You will be pleasantly surprised that after a couple of weeks just how many people you actually get connected with. As you enter into the business world you have two sets of competition. Those who are also leaving college and starting their search like you and the people who are already in the job market. This can seem overwhelming at first, which is why it’s important to have a game plan. Having a plan will help you think through what you want and how you are going to get there. If you need help creating a plan and staying motivated, hiring a career coach is a great option. Start with the following pointers and the information will start to flow. Write everything down you think of, no matter how small or irrelevant. It all adds up and builds your plan. Pick three jobs and create a one-page overview for each one – Ask yourself why you are choosing each job. If I get an interview, what am I going to offer them that is different from others (your USP)? Is this a career move or just a job to get me onto the employment ladder? If this is a career move, what are my prospects for the next 3-5 years? Do not apply for everything you come across – This is a common problem that a lot of people make (your competition). They plow through 30 jobs per day and insist on sending the same cover letter and resume to all of them. Hiring managers are sifting through and looking for inspiration, not the same template using the same wording as the last five he or she read. Apply with thought and care. Do some research on each company and if possible, on the person you are applying to. Knowing just a tiny amount of information shows you have taken the time to research the company and the people within it. Brace yourself – You never know when a hiring manager will pick up the phone and call you or email you. Be ready and prepared. There is nothing worse than a hiring manager calling and being greeted with “who is this again?” They want to hear how keen you are, happy you are that they have called you and most importantly how attentive you are. If you miss the call or email, respond immediately. Don’t make them wait as they will be calling other people at the same time. So you made it through college and you actually did well on your grades which is great! Now the business world is looming and you have a ton of fabulous learning opportunities ahead of you, starting the moment you apply! Take note of these points and use them to your advantage and they will pay off! If you do not hear anything back after applying, follow-up and ask why. This may not get you the job, but it will help you understand more about the process and maybe deliver a golden nugget of insight that helps you improve your approach or resume. If you interview and do not get the position, make sure you send ya thank you note and if you get the opportunity to ask a question, find out why you were not offered the role. And some additional bonus tips for when you get hired! Once you start, ask questions that are relevant to the role and the company (not about your Facebook latest or the breed of dog you are thinking about buying). During work hours, show your care and interest in making the role better. Ask questions, listen carefully to the answers and learn. In your downtime (your lunch break, for example), stay on the professional track by asking your line manager how people progress in the company. Again, keeping the questions work related will show you are keen to learn and progress. In the current business world, this is becoming so rare that you will stand out. Even the mundane, boring tasks need to get done. You should approach every task with the same amount of energy and enthusiasm as the next. Remember, your employer is watching and looking for people who are adding value and bringing energy to the table. Make sure they see you in the best possible light. Need a little help moving into the workforce after college? Browse our directory of career coaches or request a personalized coach recommendation! Paul is a Career & Executive coach based in Houston Texas specializing in helping people on a global basis to transform their careers and find purpose and passion in their professional lives. He has a 20+ year in corporate staffing and human resources and moved into career coaching to help people overcome the challenges he personally faced when deciding to change career path. His personal goal is to reduce the startling statistic in the American Workforce which is almost 70% of people being disengaged with their current employer. Connect with Paul on Noomii and his website.